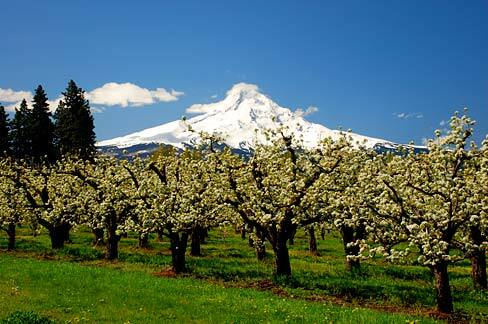 Most fruit trees should be planted in early spring, especially apple trees so that they will get plenty of rainwater. This allows them to grow roots all summer long before the colder weather causes them to become dormant. It is important to water these new trees frequently, for at least ten minutes, three times a week with your hose running a very slight stream, in addition to rainwater. The stream should be as thick as your pinkie finger. This will cause a very deep watering, which lasts a couple of days at least. First, dig a hole that is three feet deep and three feet wide. Fill the hole halfway with fresh soil and organic material. This will give the tree a very rich basis of nutrients to its new roots. Place tree in the hole, making sure that the tree is deep enough to cover all the roots. Then, shovel the original soil around the tree, making a slight mound atop the new roots. Place a stake about 6-12 inches from the trunk. Make a loose, but firm figure 8 around the stake and the tree right below where the tree becomes flexible. Finally, make sure it has plenty of water, especially the first year of growth. The suggested amount is a pencil-thick stream for ten minutes, three times a week. 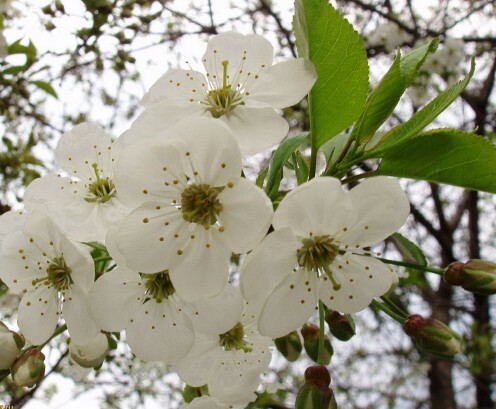 When Do You Prune Fruit Trees? Trim before new growth grows. Prune after chance of sun scalding will occur. Trim after chance of frost has passed. Trim after it has hardened and no new growth will grow. Prune while weather is dry. Trim while tree is dormant. 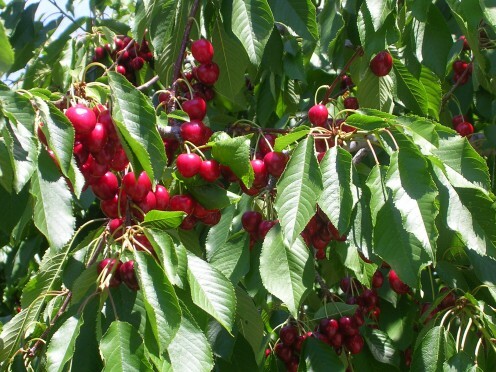 Trim after common diseases to sweet cherries have passed. How Do You Prune Fruit Trees? The main purpose of pruning a fruit tree is to make it healthier, make it easier for branches to breath, and make it more productive. The best way to make a tree more productive is by allowing it to be healthier and more breathable. Regardless of the reason for pruning, you want to make a thirty-degree backward angle cut right above a healthy bud. You do not want to trim below a bud, because you don't want your tree to have stubs. 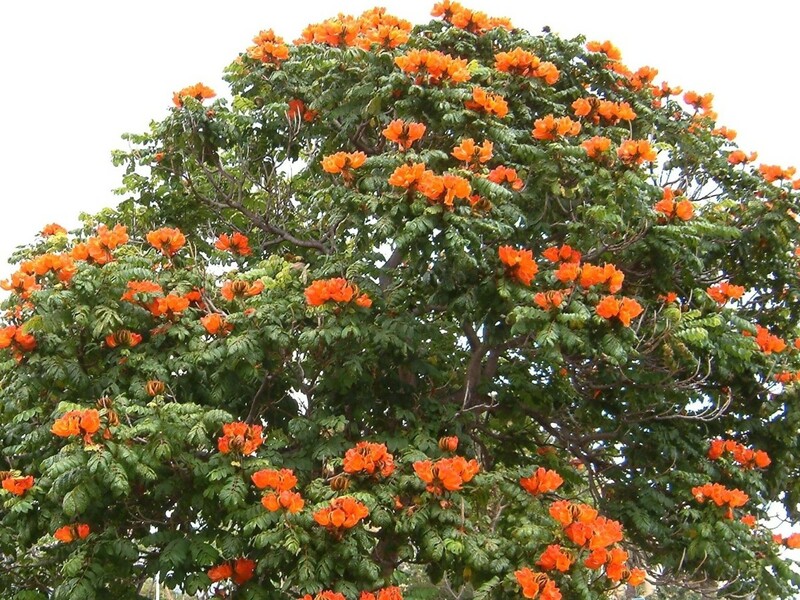 You want to make sure that new growth will grow on your tree wherever you have trimmed. Also make sure you are using sharp, clean shears to prevent from causing split branches that can be subjected to disease. Clean your shears with alcohol between each tree. 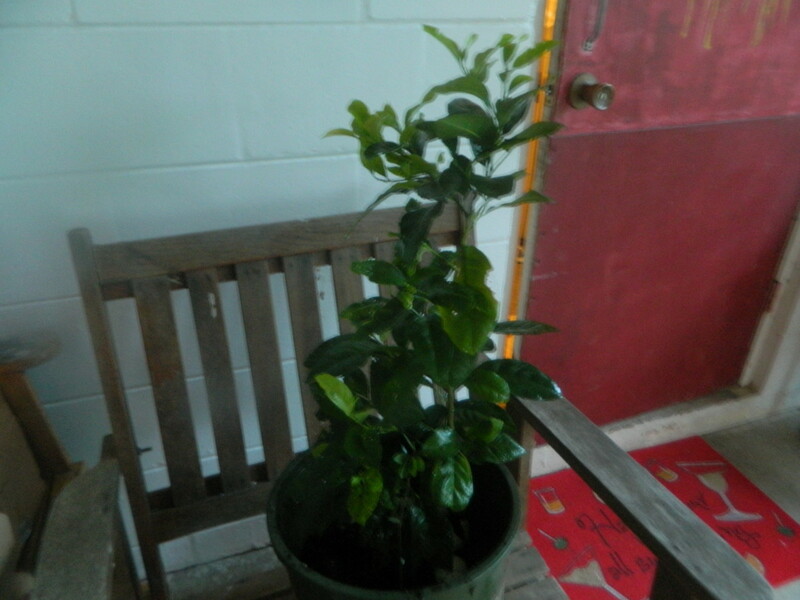 This will help prevent the spread of diseases from one fruit tree to another. Should Fruit Trees Be Trimmed? Yes for shape of the tree and quality of fruit. Yes, but only to get rid of dead and damaged branches. No, they should be let to be free from influence of humans. Make Your Fruit Tree Healthier: The first thing you want to prune off your fruit tree is any dead, damaged, or diseased portions of the tree. This alone is the most crucial part of pruning a fruit tree. Dead and diseased portions are easy to find, as they usually are identified by dying, rotten fruit and leaves, or blackened branches. When trimming off dead or diseased portions, make sure to make your cut right above the closest, healthy bud. Damaged portions are less easy to spot. If not taken care of, those portions will die, which causes more of the tree to die Damaged branches might include cracked or broken branches. Make sure to trim the damaged portion in the same fashion as you would with a dead portion above a healthy bud or leaf. Allow Branches To Breathe: By making it so that the branches can breathe and grow more easily will allow for your tree to grow larger, tastier fruit. If left to its own devices, your fruit tree will bear fruit; although plentiful, the fruit will be much smaller. 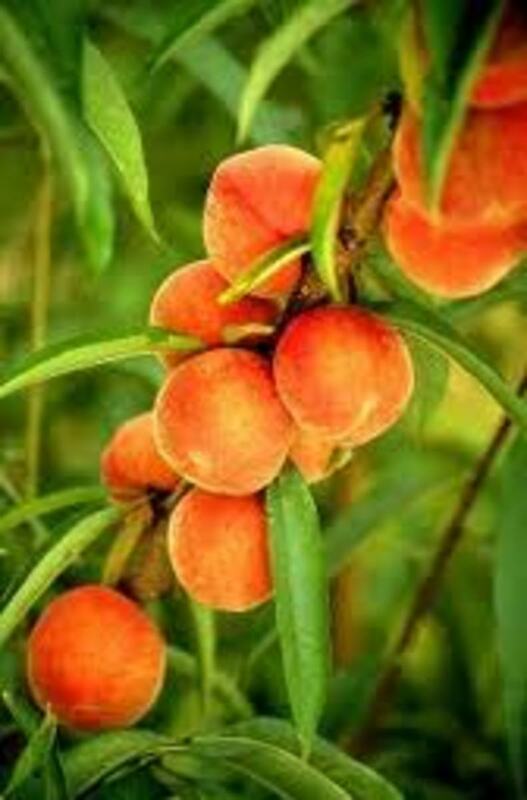 Most of the fruit will be too small to harvest, and others might become damaged by disease or pests. On the other hand, if you over-prune the trees, then the fruit will become too big and flavorless. A good rule of thumb so that you will not over-prune is to never cut a branch that is more than two inches thick. The branches you want to trim most frequently are twigs and branches that point inward or downward. These ones will interfere with the healthy upward growth of the most viable twigs and branches. By eliminating the branches that are not reaching for the sun, the tree can focus, giving nutrients towards the parts of the tree that have the most sun exposure and more likely to produce tasty, sweet fruit. Trimming a fruit tree should be done differently as the tree gets older. The first year, you want to focus on limiting any downward facing branches. This will make it so that the fruit will be less accessible to ground dwelling animals. It will also give the tree a more appealing appearance. If there are any long, awkward branches that stick much further out than the rest of the tree, trim down no more than two-thirds of the initial length. This is important, because a long, awkward branch may put the tree off balance, which could result in the branch overpowering the tree many years later. Snow or other heavy pressures could cause breakage later on. The second year, you want to follow much of the same instructions as in the first year. Fortunately, the tree will continue to grow plentiful and rich. The branches you want to encourage are the ones that stick upward or outward. Any branches that are beginning to grow inward can cause overcrowding later on. Trim them to allow your tree to be more breathable. The third year, the edible fruit will still not have produced on the tree, but the leaves and branches will be plentiful. There should be at least four main shoots. Make sure these four shoots allow the tree to be even and not off balanced. 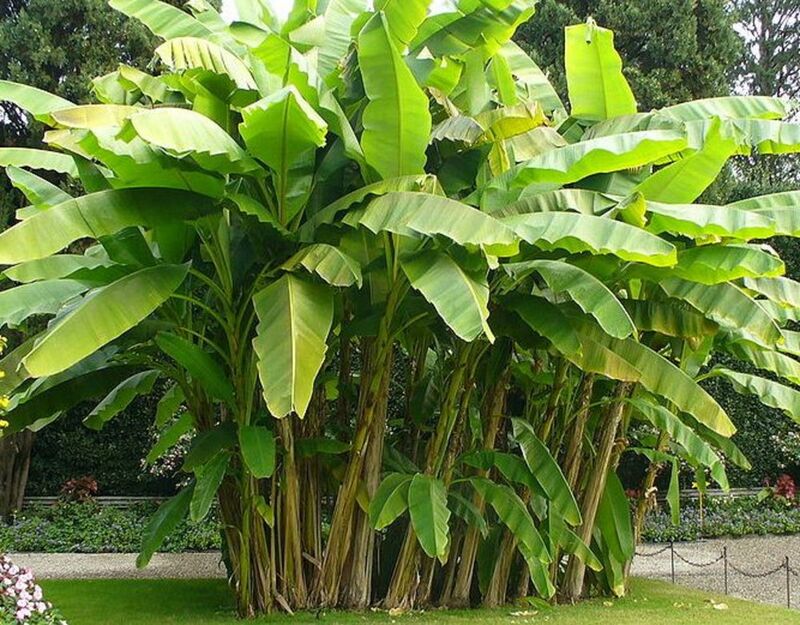 You can trim the branches down to no less than half their original length. Inward facing twigs should also be trimmed while encouraging the growth of upward and outward facing growth. If you feel the need to trim awkward growth, trim them so at least four buds are present. The fourth year, the fruit will begin to develop. Although the tree is still not completely mature. Continue to make sure that the four main shoots are equal without trimming more than a third off of the branches. Continue to limit inward facing growth as in the previous years. This year, there will be much less trimming than years before. 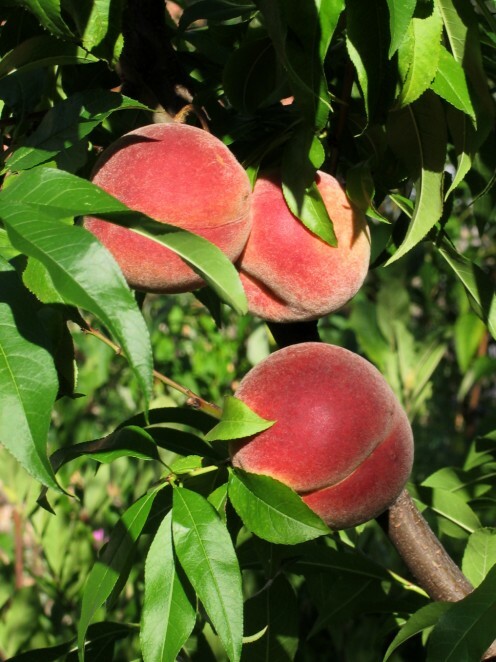 The fifth year and beyond, your fruit tree will finally be a mature tree! The main structure of the tree should be well established and just minor annual pruning will be necessary. It will be easier to maintain as it gets older with less and less work involved. Now it's time to enjoy the fruit. 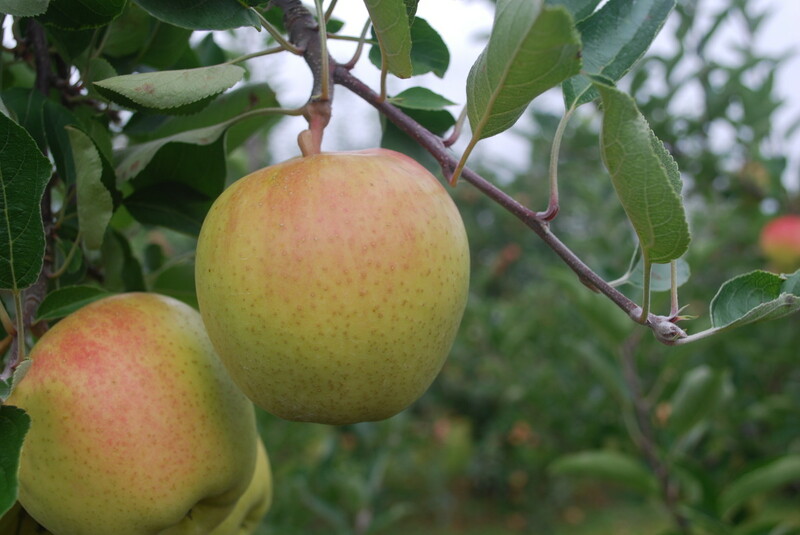 We have a large assortment of fruit trees with various grow zones so it really just depends where you live. We can ship these trees directly to your front door with our foolproof method of boxing. Yes, it is very much worth the hardwork teaches and bestvision. We used to have fruit trees around our home when I was a child. They required a bit of attention, but the work was worth getting those sweet cherries and plums. Fruit is very useful for our health and tree plantations is very important for our environment. Actually, NC4Life I thought I mentioned it, but I'll double check. It will usually start to bear fruit in the fourth year, which is when there are usually four really nice sized branches that become the core of the tree. Once those are fully formed is when fruit begins to develop. Cyber Shelley, so glad to bring back good memories. We have some brand new trees, so I can't wait until they've been here for awhile. We just moved in last summer and only started planting them this year. This is extremely informative, one thing I was wondering though is how long does a tree take to grow before it begins to produce fruit? My best guess would be the following year? Loved reading this, we grew peach and pear trees when I was a little girl, just so beautiful when they flowered. Voted up and useful. This hub took me back to my childhood days. My grandparents used to grow fruit trees. I believe that fruit trees should be trimmed to get rid of dead and damaged branches. Voted up, interesting!